A pot of gold awaits at the end of the rainbow, off in Winners Paradise. Click here to play! Golden birds fly through the air bearing gifts and treasures that cannot be found in the real world. Winners Paradise is for the best slots players throughout time, a special place that does not just accept every kind of player. Only the cream of the crop can play here as a reward for their dedicated playing over the years. The Winners Paradise slots are a simple three reel, single payline slot machine with a gambling theme. 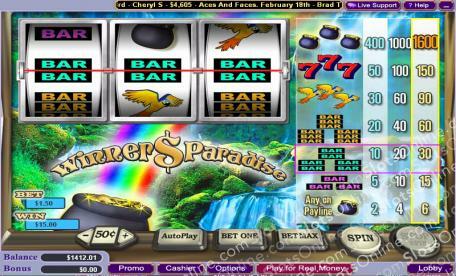 With basic symbols, such as pots of gold, red sevens, colorful birds, and BAR symbols, the Winners Paradise slots are easy to understand. Why play new and confusing slots if you are used to the classics? If you can remember a time before slot machines became overly complex, then you are welcome in Winners Paradise, where the game is simple and the winnings are huge.